Tangy, sweet and spicy, green tomato chutney is great as burger relish or with cheese and crackers. 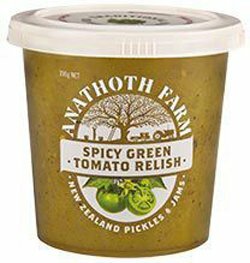 Made with the finest green tomatoes and carefully selected spices. Green Tomatoes (48%), Sugar, Onion, Vinegar, Starch, Salt, Mustard Flour, Spices, Herbs.